As I sit on my deck on a warm May evening, I hear Sherman out in her pasture. I know what's happening: One of her children, either Buttercup or Caleb, has wandered too far from her, and she's moo-ing her concern much like when human moms call to their children in the back yard -- "Don't play near the road, kids. Stay close to the house where I can see you." 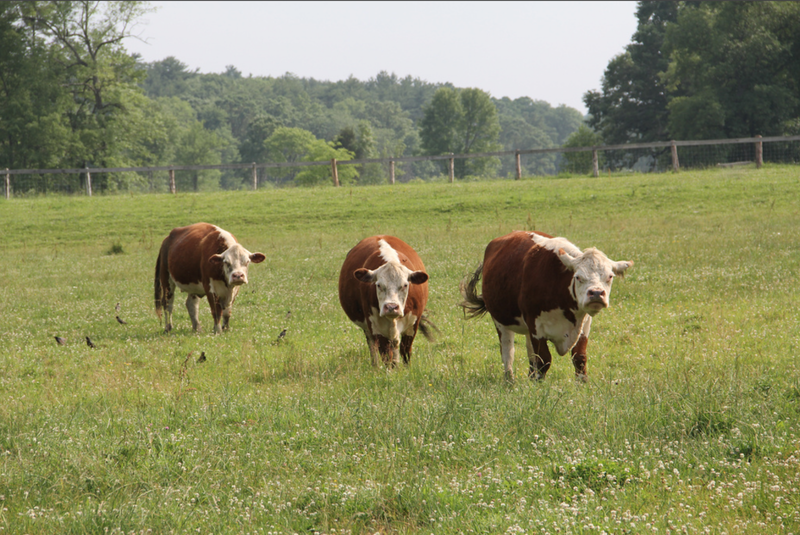 As Herefords, Sherman and her kids were destined to be slaughtered for meat. But when the beef operator died and his children sent 1,000 cattle to slaughter, the Shermans were saved when a neighbor purchased them. Sherman is about 14-years-old....we've watched this doting mom -- rather listened to her -- care for her family for a decade. Each year in the U.S. alone, close to 32 million cattle are killed and turned into artery-clogging, cholesterol-raising, global-warming inducing hamburgers, steaks, ribs, roasts, and other food products that are terrible for human health and calamitous for the environment (cows account for 20 percent of methane emissions, and methane has 20 times the global warming power of CO2). Beef cattle are "fattened" in filthy, crowded, fly-infested feedlots and slaughtered at two-years-old. No cow suffers as much as the dairy cow, however. 2. Amputation of most of the tail, performed without anesthetic, a practice opposed by the American Veterinary Medical Association. 3. Confinement in "tie stalls" just slightly larger than their bodies . 4. Standing for hours on concrete, which is hard on their joints and extremely slippery. 6. Forced production of more than 20,000 pounds of milk in one year, more than double what cows produced forty years ago. 7. Extremely high rates of painful mastitis (inflammation of the udders/breasts), a condition responsible for 16.5 percent of recorded deaths in the industry. 8. The theft of their babies a few hours after birth. Theft? Well, moms, consider this: If a man walked into your room just after you'd nursed your child for the first time, grabbed your baby and walked out with him or her, what would you call that? 9. Slaughter as soon as their milk production tapers off, generally between three and four years old. 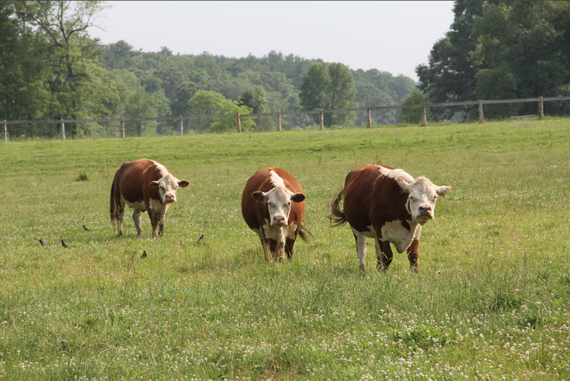 Cows in a natural environment lived to 20 years or older. 10. Tens of thousands of cows each year -- who've given their lives, and given up their children, in service to humans but are too weak or sick to walk due to industry conditions -- are labeled "downed cows," and are prodded, kicked, beaten or bulldozed to "the dead pile," where they are left with other dead and dying animals, until they take their final breath. To all you human mothers: Is it such a stretch to believe that a cow loves her calf? Such a stretch to believe that there may be some universal truths about motherhood that trump species? Maybe a mother is a mother is a mother, no matter her species, and maybe a mother's love for her child is the strongest love there is. That sure is what Sherman, bellowing in the pasture below, suggests. The goal of turning animals into food products is simple: profit. In honor of mothers of all species, have the courage to watch the video below. Understand that factories selected for investigation by the folks at Mercy For Animals are selected at random. In other words, what you're watching is not an anomaly... it's business as usual. Understand that the suffering endured by cows is endured by all animals grown to feed humans. 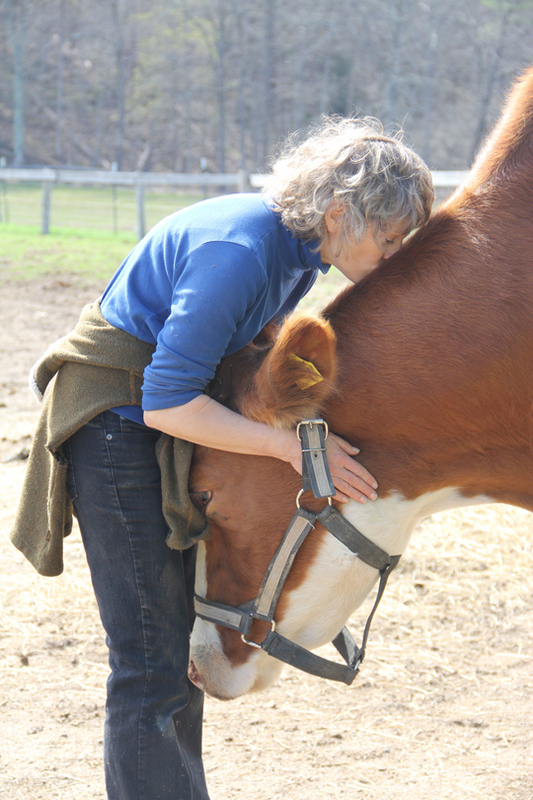 Please come meet Sherman and her children, and over 300 animals living at Catskill Animal Sanctuary, who have taught us that distinctions humans make between "us" and "them" often have more to do with powerful cultural conditioning than with reality. We are open on Saturdays and Sundays beginning at 11 a.m. Listen for Sherman. If Caleb is wandering, she may well be moo-ing her head off. PCRM - What is Lactose Intolerance? Food Matters -- How Many Pus Cells Are In Your Milk? Happy Mothers Day from all of us at Catskill Animal Sanctuary. When they trust their humans, many cows are remarkably affectionate. Here, my friend Tucker has wandered over for a hug.